The Commercial Electric 3-inch Non-IC Recessed White Gimbal LED Lighting Kit includes Non-IC GU10 socketed remodel housing and a white gimbal trim. Included in this kit is a GU10 7.5-Watt LED bulb. Adjustable tilt light up any desired focal point of the room. Compatible with dimmer switch for different illumination needs and increased energy saving. TWO YEARS LIMITED WARRANTY from the original date of purchase against defects in material and workmanship. This warranty is limited up to the amount of original purchase price of the product, excluding any installation nor repair labour cost. For any inquires call 1-800-345-0542. The Commercial Electric 3 in. Recessed Light Kit includes a IC remodel housing and Brushed Nickel Trim that gives GU10/50 Watt equivalent light output. Compatible with dimmer switch for different illumination needs and increased energy saving. ENERGY STAR certified airtight construction meets California Title 24 requirement. Rated for wet location make it applicable for shower and exterior application. The 3 inch square rubber furniture cups protect hardwood and laminate floors from scratches and dents. They feature anti-skid rubbers that prevent furniture from moving. The inside surface is also ribbed to prevent movement of furniture. The rubber is resistant to most household cleaners. Globe Electric's All in One New Construction Recessed Lighting Mounting Plate can be used with most 3, 4, and 5-inch recessed kits and is ideal for use in new construction projects and suspended ceilings. Best used with standard strong to lightweight ceiling tiles (5/8 inch thickness). Four 12-inch hanger bars are included allowing for recessed remodel kits to be installed in new construction installations. Made of strong aluminum so your light is sure to be secure for a long time. 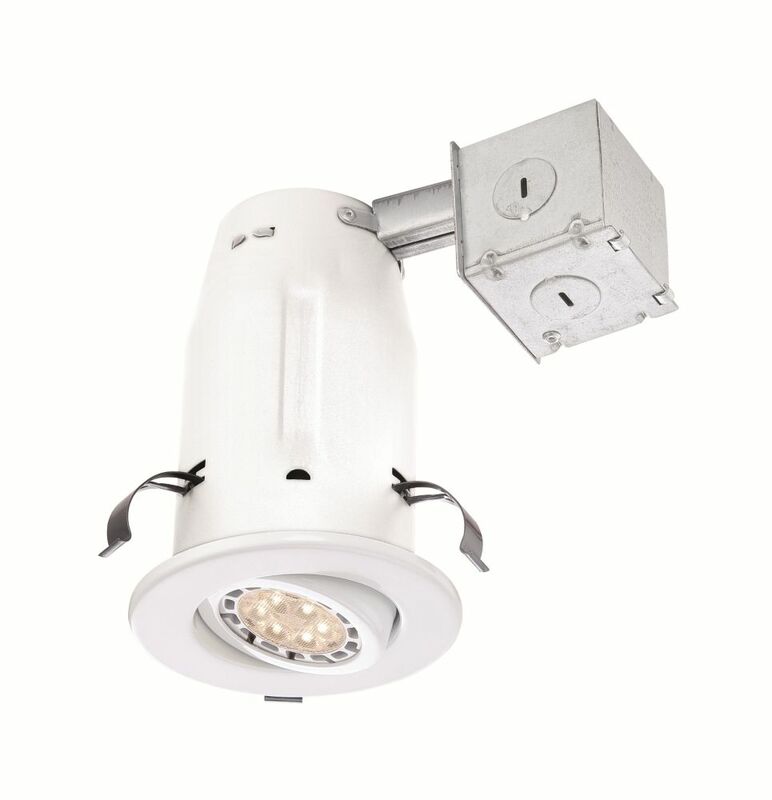 3-inch Recessed Non-IC Gimbal LED-Lighting Kit in White The Commercial Electric 3-inch Non-IC Recessed White Gimbal LED Lighting Kit includes Non-IC GU10 socketed remodel housing and a white gimbal trim. Included in this kit is a GU10 7.5-Watt LED bulb. Adjustable tilt light up any desired focal point of the room. Compatible with dimmer switch for different illumination needs and increased energy saving. 3-inch Recessed Non-IC Gimbal LED-Lighting Kit in White is rated 4.1 out of 5 by 8. Rated 1 out of 5 by UnhappyCustomer from Replacement bulbs not available Seriously.... I was a fool to put these throughout my house. Rated 5 out of 5 by Nailgun from Great little fixture, and very useful for a number of different situations This fixture is very flexible in terms of where you can install it. I have used it inside of cabinets, extra lighting around the stove, and numerous other locations within the kitchen. Rated 5 out of 5 by Alan from Great product Product was as expected. Easy to install, functions great. Rated 5 out of 5 by Dale from Looks good, easy to install These are dimable LED lights, and they do flicker some when at mid-power. Adjusting the dimmer switch slightly will end the flickering. With the huge Energy savings, I t's something I can live with. Rated 4 out of 5 by ohlo65 from Very nice light. I was looking for a light to put in my foyer. I bought some that had an almost 45 degree light output. Way too wide for my area. These are perfect. About a 30 degree cone off light. Aim able, so you can make sure it lights precisely the area you want. Have it for stars because I have yet to find a dimmer that works with these lights. Very nice unit. Rated 5 out of 5 by John from LED Retro Light Install This was an very simple install. Directions were easy to follow. I bought three and installed all three in under an hour. It would be best to have a hole saw to fit the diameter but would not spring for the expensive saw. The lights look great, very bright with a very clean ceiling look. Rated 5 out of 5 by KK111 from Great Lights The lights work great. They dim and brighten back up instantly with no buzzing.